The Washburn High School Ecology Club participates in several citizen science projects and service learning projects. 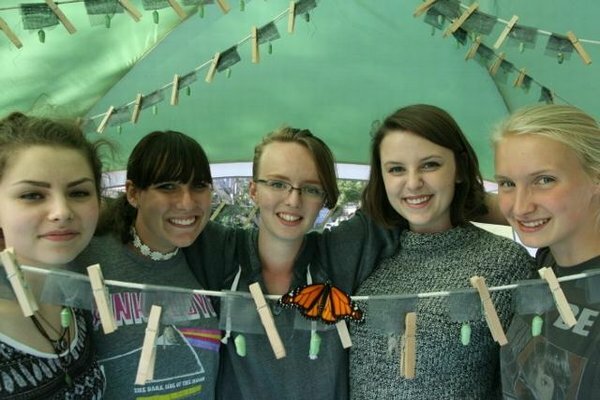 Currently the club is involved with the University of Minnesota’s Monarch Larva Monitoring project, the College of William and Mary’s Milkweed project, The Great Sunflower project and the Monarch Tagging project sponsored by the University of Kansas. The club also is an active participant in the Adopt a Beach service learning event under the direction of Alliance for the Great Lakes. Twice a year the club monitors and cleans four beaches along the walking trail in the city of Washburn. Last fall the club hiked with the AFS club to St. Peter’s Dome. Currently, the group is investigating the proposed National Marine Sanctuary application process and will be giving informational presentations to the students of Washburn High School. On Earth Day, April 22nd, Randy Lehr from the Water Institute at Northland College, will be given a lyceum on Lake Superior and Climate Change. This year’s fundraiser will be the sale of monarch mini oasis; keep your eyes open for ordering information. The culminating activity for the 2015- 2016 year is a sea kayaking trip to the sea caves made possible by a generous grant from the Washburn Community Education Foundation.